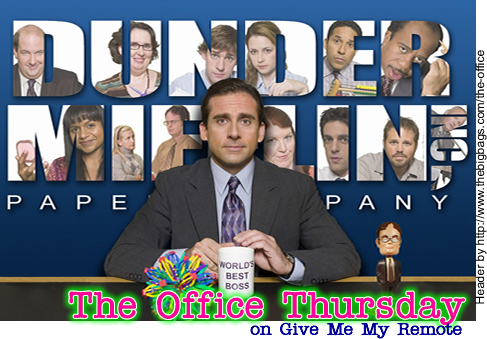 THE OFFICE Thursday on GMMR is going to have to be short today. That’s what she said. No time!! But she did. NO TIME!! A lot needs to happen in my world today before I get to site down an enjoy THE OFFICE tonight, so let’s get to it (that’s what she said). Set the TiVos now for Steve Carell’s appearance on The Late Show with David Letterman TONIGHT! David Koechner (Todd Packer) will be appearing on Jimmy Kimmel Live TONIGHT! Steve will also be on The Tonight Show with Jay Leno on Monday,October 22nd. Jim (and Pam) have played some really incredible pranks on Dwight Schrute over the years, but which one is the best? Share with us your all time favorite Office prank. I know mine, but I’ll wait to share it until I hear some of yours. Oh Halpert!! I don’t know about you, but I’m ready to fight for Dwangela. Andy, haven’t you noticed our little Miss Kapoor. She’s single and lonely, go sing your tunes her way, Dwight needs his animal. This is normally wear I encourage you to spread the love of THE OFFICE and check out Office inspired products at the GMMR Online Store. Sadly, NBC/Universal demanded that all OFFICE related items be removed from CafePress so sadly they are no more. I understand their issues, but on the other hand I guess I wonder why they would turn down free publicity of their TV show. It’s not like NBC.com is creating fun shirts with Office quotes. Unfortunately some asshats over at CafePress were (a) selling items that were already available on NBC.com and (b) selling products with The Office logo or the Dunder Mifflin logo which is definitely against policy. I’m pretty disappointed but I’ll respect the decision because it’s their show. I only wish that if they were going to take some of these designs away that they would make them to sell on NBC.com. Oh well!!! Thanks to The Office LJ peeps and OfficeTally.com for helpful links. Is there another place you can sell Office-related GMMR gear? Plan on being at the chat again, too! Cannot wait for a visit to the Schrute Farm! My fave prank on Dwight is a tie between Jim dressing up as Dwight and Jim putting Dwight’s things in the vending machine. I just read quickly through that list of the top 25 Office moments. You can’t really go wrong with any moment from The Office but the list missed one the top moments ever – when Jim told Pam he was in love with her in “Casino Night.” How could the have missed that defining moment? And finally, definitely count me on Team Dwangela? As much as I love Andy, Angela and Dwight are made for each other! Can’t wait for tonight! Office Thursdays are my favorite day of the week! Thanks for posting this. I totally forgot that Steve was going to be on Letterman. I need to set my DVR. I loved that article of Mindy! She is amazingly funny. My favorite all-time prank happens to be one that we’ve never seen. I love the concept of Jim putting nickles in Dwight’s phone and having to wait patiently for a week or so for the payoff. What I wouldn’t do to see Dwight hit himself over the head with the phone. CrazyGringa, I work with someone who did that to a co-worker. Another thing they do is put a piece of tape on the phone just big enough to cover the holes in the phone. If you put the tape on the ear part, they can’t hear what anyone is saying to well and have to keep asking them to repeat it or speak up. If you put the tape on the mouth part, the other person can’t hear what they are saying and they have to yell into the phone until they figure out the tape is there. It’s kind of funny, you should try it one day. I think my favorite prank was them making Dwight’s computer come apart. That was SO funny. I’ve been waiting all day for Office Thurs. and I came back from a meeting and here it is. Kath – FYI, the link for the Top 25 Office moments took me to Kate’s blog again; so I couldn’t view it. One of my favorite Jim & Pam pranks on Dwight was when they made him think it was Friday on a Thurs. I also loved this past week’s prank from Launch Party. It was so classic and so well executed so I think that’s got to be my number one fav. of all time. Especially at the end when Pam saw how dejected Dwight was about Angela and she tried to make him feel better by calling him “the superior being”. It shows how sensitive Pam is as compared to Karen who told Jim not to feel sorry for Jan after her meltdown because “she’s nuts.” Crazy people have feelings too. I can’t wait to see them together on the beet farm tonight. Oops. Sorry about the broken link, it has been fixed. So my DVR is getting a little full, so I had to erase some stuff today. It was a touch call but here’s what I let go of. Casino Night – It’s been there since May 11, 2006 and it’s not going anywhere any time soon. aww, not that I was able toa fford anything from the store (I can’t even afford food! ), but I loved them. But a new video makes me happy. Another inaccuracy on the Rolling Stone top 25 is that Dwight complimented Angela by saying that she looks “as beautiful as the Queen of England”, not Phyllis. GMMR, you still have Casino Night on there since 2006??? Wow! I just pop in the dvd but the dvr is much more convenient. I have to applaud you for that. Mannie, that is so awesome! Thanks for the tips. I am definately going to use those. I should finally be able to make it to the chat tonight!! Something that top 25 list left out was The Dundies!! Who doesn’t love Pam’s drunken speech and falling off the bar stool? Holy smokes, the chemistry between JK/JF and Jim/Pam is off the charts. Great videos. You can’t wish Andy on Kelly Kapoor! Can’t you see that there’s a Darryl-Kelly romance blooming? He knows how to treat a lady with respect! Ok, seriously, that’s their top 25 monents???? Of ALL TIME???? Uh, no. I would pick maybe one or two of those for my list but the rest?? Funny, but not THE BEST moments of all time. Not even close in most cases. My absolute favourite Jim prank is when he puts Dwight’s desk in the men’s bathroom. Let me explain why. Ok, it’s not THAT original. But not only does Dwight take a seat and answer his phone “Dwight Schrute”, he finds out it is Jim and HELPS HIM with his question. I mean, that is who Dwight is. And that is why Andy better keep his hands off Angela or “monkey”, which we hope will be affectionately named soon. Man that was an amazing episode!! I’m in love with Italian too. Rolling Stone’s Top 20 are good but I think they picked the wrong Andy singing moment. My favorite was seeing him play the banjo and singing Rainbow Connection in pig latin. The Oompa Loompa song was a close 2nd. But no one’s Top 20 will be the same. I’ve got to agree with some of these comments–the Rolling Stone article just wasn’t that good for me. They missed a lot of key moments. The Kiss, anyone? And several of the moments I didn’t find that funny after a long time. Seems like they wanted to pick more recent Season 3 episodes than the classic and withstanding Season 2 moments.